Menomonie Rifle and Pistol Club, LLC. 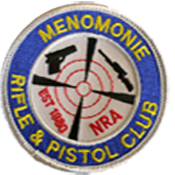 The Menomonie Rifle and Pistol Club, LLC. hosts the following events at the Menomonie Public Shooting Range. All events are open to the public. For some events portions or all of the range is closed to other activities during the event. Some events may require pre-registration and/or an entry fee, or limited to specific type of shooter (hunter safety, Women on Target, Youth Muzzleloading Clinic). All content is copyrighted by Menomonie Rifle and Pistol Club, LLC. All Rights Reserved. ©2010 - © 2019 . Send comments and suggestions to: Comments.